Carlos III, portrait of hunting. Goya. Museo del Prado. Madrid. King of Spain, born in Madrid, January 20, 1716, and died in the same city, from December 14, 1788. He/She was Duke of Parma and Plasencia, between the years 1731 to 1735; King of Naples and two Sicilies, from 1734-1759; and finally, King of Spain, from the year 1759 until his death. He was the eldest son of Felipe V and his second wife, Isabel de Farnesio. Since the previous marriage of the King, with María Luisa de Saboya, were born three children (Luis, Felipe and Fernando), men who had dynastic preference to the Spanish throne, nobody could suspect that Carlos would rise in the future to the throne. No one except his mother, the Queen, who obsessively devoted his life for the sake of their children at checkpoints highest potential, and with special emphasis placed Carlos, her favorite son. Thanks to the effort and commitment of mother, and also due to certain lucky strokes of luck and chance, his son could climb finally to the Spanish throne, in the year 1759, after death, without offspring, his stepbrother Fernando VI. The childhood of the infante Carlos unfolded smoothly or important features. Nature shy, quiet, and very responsible, it was always at a secondary level, leaving the limelight to his half-brothers who were destined to reign.Isabel de Farnesio, knowing the little possibility of their children to access the Crown, applied a revisionist policy of the Treaty of Utrecht at the hands of the Prime Minister Alberoni, which Felipe V had lost all of its Italian possessions. His goal was to retrieve them so that they were transferred to their children. Resulting in secure the attainment of its objectives, the Queen underwent his firstborn to an intense preparation on Italian politics and customs of the country. After the downfall of the Minister Alberoni, the new Minister, and favourite of the Queen, baron de Ripperda, managed the Vienna Treaty, signed in the year 1725, that Carlos was named Duke of Parma and Plasencia, following the death of Antonio Farnesio. Felipe V assigned him a pension of 150,000 ducats per year and a group of advisers for his new political role. Carlos was received, in October 1731, with large samples of affection and hope for the parmesanos, happy to return to being ruled by a Farnese. In January 1724, Felipe V abdicated in favour of his eldest son, the Prince of Asturias Luis I, who only came to reign seven months after a sudden attack of smallpox. This circumstance gave rise to the Queen certain hopes that one day could reign his son Carlos. The second son of Felipe V, the infante Felipe, had died previously very young, so it only had Fernando as heir to the throne. Therefore, Isabel de Farnesio, although Felipe V already showed obvious signs of dementia, avoided that Fernando happens to Luis, and forced to return to the throne, Felipe V making sure this way two objectives: first, to continue to exercise her power over an increasingly degenerated and pusillanimous monarch; and second, host still possibilities on the occupation of the throne of his son Carlos, every time that the health of the new Prince of Asturias resented very often. All these circumstances, you can deduce that the second period of the reign of Felipe V was completely dominated by the reina Isabel de Farnesio, who had complete freedom to carry out his designs at home. Because of this policy of openness, the Spanish Crown was subjected to an intense activity with the European powers, treaties, conventions and covenants family, almost always contrary to the interests of the country, but always in favor of the expensive interests of the Queen. On the initiative of Luis XV de France, both monarchies sealed the first Covenant of family, in the year 1733. This approach was framed in the context of the war of succession of Poland, in which Spain intervened with France against Austria. Spain, for its support of France, would receive help to expel the Austrians of Naples and the two Sicilies, and thus be able to award the throne to Carlos. Pursuing that goal, Carlos attacked Naples, may 10, 1734, and conquered it with a quick stroke of hand. Own infant proclaimed his father, Felipe V, King of Naples, however, ruled it on behalf of his father. By the peace of Vienna, between the Austrian Emperor and the Kings of France and Spain, this first renounced his dominion over Naples in favour of Carlos in Exchange for the rights to Parma and Plasencia. Change not supported doubts, and was accepted by all, especially by Isabel de Farnesio who saw his son sat as King of a powerful Italian territory. The Spanish Queen would not rest to recover the duchies exchanged for her other son, the infante Felipe. Once installed on the throne of Naples, Carlos was able to undertake the task of reforming their Italian Kingdom with energy and prudence. Thanks to the support of the powerful Neapolitan bourgeoisie, could limit the power of the nobility landowner, which put under his direct orders. Also made a profound judicial reform, carried out in two phases: first, with a collection and updating of all the laws of the Kingdom in 1735; and later with the enactment of the Caroline code of 1752. He/She also sought to liberalize internal trade and promote export. It dealt personally with regular a Concordat with the Church, in the year 1741, by which church property of the realm had to pay half of the normal tribute. Culturally it sponsored many projects, decreeing, amongst others, the excavations of the Roman villas of Herculaneum and Pompeii, found recently. In foreign policy, the most important events were the happened during the war of succession in Austria, in which it participated together with France and Spain, although with results insignificant for his Kingdom, since he/she was constantly surrounded and pressed by the English Navy. After the signing of the peace of Aachen, in the year 1748, his brother Felipe obtained the duchies of Parma and Plasencia, and rights to the Spanish throne where Fernando VI did not have offspring. These concessions so positive were the consequence of the negotiating effort of his mother, the Queen Isabel de Farnesio, who saw, finally, made reality its objectives. In the year 1738, Carlos married, by proxy, the Princess María Amalia of Saxony, whose Union were born thirteen children, of which only survived seven. The two first, males, accused a marked mental deficiency. The eldest son, named Duke of Calabria, with the time soon showed an evident stupidity and was accordingly removed from succession. The second son, strong and healthy complexion, suffered from a lack of intelligence about any matter outside normal or common. His father did not allow this Prince, which he/she would grow some criterion, never interfere directly in Government Affairs, for what turned out to be a mediocre Prince of Asturias and, however, acceded to the throne, under the name of Carlos IV. The indolence of this sovereign all precipitated the decline of the Spanish Bourbons. July 9, 1746, ascended the Spanish throne Fernando VI, son of the first marriage of Felipe V with María Luisa de Saboya. This monarch was married to Bárbara de Braganza, which was also very attached, as his father with their wives. On the death of this, the twilight of the King became evident and accelerated; He/She died August 10, 1759, childless and in the midst of strong attacks of madness. Thanks to the Treaty of Aachen, signed in the year 1748, Carlos was the direct heir to the throne and held the Spanish Crown with the name of Carlos III. The Italian stage, besides representing a great experience of Government for Carlos, had two very important educators consequences for the future Spanish monarch. On the one hand, it introduced him to a world developed and full of luxuries, far removed from the austerity of the Spanish Court; not in vain the Neapolitan Court was known as the Court of miracles. On the other hand, the journey passed in the Neapolitan Court provided Carlos a valuable experience and maturity to deal with the Affairs of Government more complicated. When Carlos was crowned as King of Spain, he/she was forty-three years of age, and was at the height of his life. While Isabel de Farnesio assumed the temporary Regency of the Kingdom until the arrival of his son, Carlos abdicated to the Neapolitan throne in favour of his third son, Fernando, given the manifest inability of his firstborn. His second son, Carlos Antonio, embarked with him to Spain as a Prince of Asturias and heir to the Crown. Spain hoped the arrival of the new monarch with mixed feelings. October 17 came Carlos in the city of Barcelona, received with salvos launched from Montjuïc; but in Madrid, was received with some suspicion. He/She was wary of a King who had spent twenty-eight years abroad. His first steps as a King made their way to win the affection of his new minions, so restored some privileges abolished by his father in Catalonia and Aragon, in addition to forgive enough debt to the land registry. From the outset, Carlos III intended to introduce a spirit renewal in an unchanging Spain as it was found. In Naples, Carlos III was all a representative of enlightened despotism, and in that direction raised all their actions with transformations that came to all areas of the Kingdom: ideology, institutions, society, economy, etc. For this company, as he/she did in his Neapolitan reign, it supported in the basic sectors, the bourgeoisie and the reformist intellectuals. To make the country progress was necessary to encourage the production and circulation of goods, i.e. wealth. The nobility, ossified and overly conservative and more concerned to maintain their privileges, was not for the work leading to that goal. But average, lacking kinds of privilege and wanting to get rich. Carlos III supported this sector. That support the bourgeoisie materialized in two well defined directions: raising the political responsibility, by appointing to positions of high bourgeois; and on the other hand, promoting the economic and trade protectionism. The result of this policy made the bourgeoisie was hogging more power and decision, as well as the nobility, who up to then had monopolized the important offices of the State, was closed in band to any attempt of variation that could damage their privilege minimally. At the same time, the new monarch, as the true representative of the enlightened despotism, turned to intellectual reformers of the time, as it was the case in all countries with enlightened monarchs. These philosophers sought to carry out a reconstruction of the world on new and rational basis. So those plans could be carried out they needed the guardianship of the State, which was the only one who could translate them into practice. The State created, sponsored, and spread throughout the country the so-called "societies economic of friends of the country", created agencies to carry out these projects. 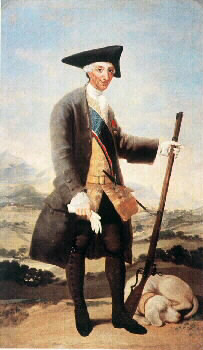 Although really Carlos III applied an enlightened despotism of European style, we can say that in Spain it had sui generis elements, which was a much more moderate movement in objectives and applications which was in French or Austrian, court for example, due to the strong influence exercised by the tradition. This caused that the measures alleged by the King would have to be introduced gradually and rather slowly, to ensure that the changes need to be made patent. To this end, Carlos III strengthened the Royal authority and applied one ever greater centralisation. His first Government was formed by Ministers of the previous monarch, Fernando VI, as for example Ricardo Wall, head of the Secretariat of State and war. In the year 1763, this was dismissed by Leopoldo de Gregorio, renowned for his noble title of Marquis of Esquilache, who became head of the Secretariat of Guerra, and the Marqués de Grimaldi at the head of the Secretariat of State. Domestic of the reign of Carlos III, well, divide in two stages separated by famous Esquilache mutiny, that took place March 23, 1766. The first measurements of Carlos III were performed using laws and certificates; all of them marked by urgency, in order to go to fixing problems that were coming to light. The first major problem was the need to reform the finance and the general economy of the Kingdom. The Crown was threatened by a mob of creditors and debts that dated back to the times of King Carlos I and the later Kings of the House of Austria. Carlos III recognized the debt. To alleviate it attempted to revive the economy by issuing decrees aimed to promote export, to delimit powers, fixed prices and wages and to apply the tax regime applied by the Marquis of Ensenada in the previous reign. But the two most important measures adopted, by its subsequent consequences were: the Constitution of the Board of cadastre, in the year 1760, whose objective was the inventory throughout the property and wealth of Spain and thus achieve an unique and universal contribution to the entire Kingdom; and the reorganization of the Council of Castile, in the year 1762, for which we sought to appoint to fill the offices to the elements most suitable, as bourgeois and technocrats with training University, and therefore better prepared. Another measure taken was the abolition, in the year 1765, the overall rate of grains, which allowed a wide latitude of buying, selling and transportation. Trade in certain articles was also liberalized and your tariff tax abolished. Unified monetary system and the actual vouchers (emission of public debt) were created. Another important measure was the creation of the Bank of San Carlos (germ of the future National Bank), strictly financial purposes and as a means of funding of the wars that kept the Crown. During the reign of Carlos III, was born the national lottery. Despite all these measures, aimed at restoring the impoverished economy of the Crown, the results were dark, when not useless. Spain returned to enter the game's delicate European balance, together with France and against England, which caused a huge military spending that left exhausted the arcas of the State and without effectiveness measures taken by Ministers of Carlos III. Socially, Carlos III ordered laws against bums and beggars, who enlisted in the service of the Spanish Armada. In the spirit of the enlightened despotism (Government for the people, but without the people) developed a shelter for orphans and the elderly in nursing homes, social policy as well as several provisions aimed to educate people on good manners: prohibition of firearms, the game in public places (only allowed the practice of billiards, chesscheckers and backgammon). One of the most effective measures and greater impact were the measures taken in the sanitation of the cities, and in particular in Madrid as capital of the Kingdom, which was stoned and lighted as it corresponded to his rank. In this first stage of the interior Carlos III policy there were changes within the powerful ecclesiastical establishment. Laws adopted had the aim of filing privileges. Among other provisions the following were agreed: that priests be restoration to their respective churches and homes; the prelates to take care of the education of his parishioners, both morally and socially; limited the authority of judges Diocesan, prohibiting them to judge civil cases without permission from the secular authorities; they were removed and were lots of useless brotherhoods; and finally, set out that all those goods donated to the Church by lay remain subject, in perpetuity, to taxes and Regal titles, in a clear attempt to curb the enormous tax benefits enjoyed by all the ecclesiastical establishment in Spain. Called Esquilache mutiny is the event that serves as a dividing point in Carlos III internal politics, happened between the 23 to 26 of March of the year 1766.basicamente the conflict was the protest of the Madrid people against the Italian Minister of Carlos III, the Marquis of Esquilache, driver of a series of measures and reforms that had angry to many residents of the capital. It seems that the measures to improve street lighting, paving, the hygiene of the streets and other directly undermined many interests that ended up coming together in the popular indignation. The measure that sparked major protests was the prohibition of further use of the long coat and the traditional wide-brimmed hat, according to the authorities they allowed to conceal all sorts of crimes and altercations. The new provision forced to wear tricorn hat and trimmed, not lower layer of the knees. Joined these decisions so unpopular a series of circumstances, not less important, to understand the fierce final outbreak of the Madrid people against the Italian Minister. It must be borne in mind that Esquilache was extremely unpopular for the people, by foreign and its position as favorite in the Court. Its renewal effort was misunderstood by the people. Another circumstance that caused the outbreak was a persistent drought that ravaged the Spanish fields, between the years 1760 and 1766, and caused that the Madrid Board of supplies would be forced to raise the price of bread, with the resulting exasperation of the Madrid people. The incident broke out on 23 March 1766. Two countrymen packed planted face to the soldiers stationed in the square of Antón Martín. They forced them to back down, but the masked men in unison, and according to the chronicles the cry of not you give me the wins!, they clashed with the guards, generating the tumult and angry protest of all the people of Madrid. Shortly after, a large angry crowd headed his steps towards the House of the seven fireplaces, the hated Minister's residence, where the mutineers desfogaron their anger by casting into the fire furniture and all kinds of belongings of Esquilache. The hype then went to the Palacio Real, so the King will hear their complaints. In the Royal residence shock was a tragedy for the mutineers when King Walloon guard fired into the crowd, causing several deaths and injuries. The next day, on March 24, the monarch, pressed by gravity which had acquired the mutiny, agreed to meet the claims of the town, which was represented by the Cuenca father, famed cappuccino from the convent of San Gil. Carlos III accepted the required demands, which were based on the petition of the exile of the Minister Esquilache and relatives, freedom of clothing, the extinction of the Board of supplies, out of Madrid of the Walloon of the King guard and lower prices of most staple foods. The King, to demonstrate their anger and contempt to the Madrid people who had dared to stand up against it, went to Aranjuez causing even more the madrilenian people and fueling a new outbreak of popular violence. The issue is not suffocated until was not published in the Gazette the order confirming the concessions. The effect of the mutiny reached elsewhere in the Kingdom. Throughout the month of April, Zaragoza, Salamanca, Cuenca, Guadalajara, Alicante and Murcia saw as its population rose against the price of bread and onerous practices of the profiteers. Actually, the mutiny had some deeper causes than the mere revolt of a city against the Prime Minister. A fight buried between the bourgeoisie and the nobility by hold the power had been occurring since the arrival of the Bourbon dynasty. Precisely, was the latter the most injured with all the reform measures imposed. Both the nobility and the clergy found impaired their interests and their economic and political independence so that induced the people to revolt. Today remains that there was an organized plan that used the pretext of measures taken by esquilache riots to demonstrate and fight against the work of the Government, as demonstrated by the spread of the revolt in other towns and villages of Spain. The mutiny did not mean a halt to the enlightened reform, but that these were applied more cautiously and tino, but always effectively by the new team formed by the successor of Esquilache, the count of Aranda. It was in this second stage when fully triumphed the reformist politics of Carlos III. Enacted decrees had more decisive and rigorous, were issued by the Secretary's Office, or by the President of the Council of Castile, presided over by the count of Aranda, the new strong man of the Government of Carlos III until the year 1773, year in which was replaced by the count of Campomanes. The plain State saw how is protecting their interests with the emergence of the figure of the Prosecutor, responsible for raising complaints to the municipality. You were also forced to municipalities with more than 2,000 inhabitants who chose four deputies with full right to intervene in the Affairs of the Government. They became to dictate measures in relation to the Church. It gave the order to resident clergy on the Court, free of charge, to their ecclesiastical homes; renewed the order issued in the 15th century by Juan I of PIN to any ecclesiastical when this profiriese words or concepts contrary to the King; is the clerics banned the use of printers in their ecclesiastical addresses, etc. But without a doubt, far more scope was the Decree of expulsion of the order of the society of Jesus, issued on 2 November 1767. The extent that remembered the expulsion of the powerful Jesuit order is framed within the context of constant clashes between the reformist Government of Carlos III, the count of Aranda, the head, and the institution Ignatian, very close to the nobility. The truth is that the same feeling of hostility towards the powerful order prevailed in all monarchies pictorial of the moment. The order had been excessive all-powerful in the previous century by its hegemonic role within the privileged classes, what he/she did hold an immense political power. Precisely for that reason, the Jesuits earned the enmity of ideological thinkers and intellectuals, predecessors of the enlightened, mostly from the regalistas, besides that they also enjoyed special rapport between the own bishops and other religious orders (for competition). To prove this last, should emphasize that when it was decided the final expulsion of the order in Spain, of the fifty-six Spanish Bishops consulted, 42 were in favour of such a measure, six not felt, and only eight of them openly showed their disagreement. At a general level, with the arrival of the despotic and enlightened budgets, ideology and autonomy of power enjoyed by the Jesuits became upset, so in the year 1755, the Marquis of Pombal, Portuguese Prime Minister was the first in the decreeing the expulsion of these in the domains of the Crown of Portugal. This measure was followed, then by France in 1764, and by Spain in 1767. Spain used the excuse of having provided the Esquilache mutiny support and encouragement, paying his printers to print posters and rhetoric against the King. In this connection, there was participation of Jesuits in the uprising, but not the company as such, but on an individual basis. The count of Aranda, from his new post as President of the Council of Castile, was commissioned to investigate the order, which appointed a Commission in which acted as a Prosecutor the count of Campomanes. A report that corroborated the evidence of guilt of the order issued in the summer of 1766. The Decree of expulsion was cash, with the consequent confiscation of the goods of the order, which were numerous, and the subsequent fulminant exile of all its members, amounting to 1,660 Jesuits in the Peninsula and 1396 in the American colonies. Thanks to the pressure of Spanish diplomacy, in the year 1773, Pope Clement XIV, ratified the regia accessible through the bull Dominus ac Redemptor, which order was definitely prohibited and eliminated in the entire Catholic Church. Ambassador of Spain in Rome, José Moñino, was appointed by the King, the conde de Floridablanca thanks to your great work before the Pope. In other aspects of the country, reforms speeded up. To promote these changes, arose, as already mentioned above, the "societies economic of friends of the country", which contributed to making the changes through two-way: grouping legally to all persons interested in the renewal; and agencies, directed from Madrid, ordered to study the proposed projects. Agricultural policy measures aimed to encourage the division of the estates and communal land deals not grown, as well as his back fence. You were allowed to enclose olive groves and orchards. He/She was banned the Lords to expel tenants from their land arbitrarily. There were provisions to limit the privileges of the Mesta. In the year 1788 was issued the important measure that prohibited the establishment of new entailed estates. The most ambitious of this period measure, and it highlighted the desire of the Crown by take advantage of lands, was the attempt to repopulate Sierra Morena, which was allowed to seat 6,000 settlers, Catholic, Flemish and German. For the project was Manager Pablo de Olavide. The first settlement was called La Carolina, in honor of the King. In 1775 he/she already had fifteen new populations. The project ground to a halt when falling into disgrace his executor, Pablo de Olavide. Industrial renewal experienced since the beginning of the century acquired new booms under the reign of Carlos III. Agricultural and textile factories with the hiring of technicians and foreign machinery have been created. Trade is liberalized, abolished the tax of the Alcabala (existing since King Alfonso XI). In the year 1778, was granted the freedom of trade of oil and were also allowed free trade with America, that way broke the monopoly which held the ports of Seville and then the one of Cádiz. The provisions of the year 1771 to be declared compatible with the dignity of chivalry and Honorable manual trades were completed in the year 1784. This measure meant that low and middle nobles could develop trades and jobs formerly banned them because of their socio-legal status. It was in this period when public works acquired a relief and level never reached, both qualitative and quantitative. They were the channel Imperial de Aragón and the Manzanares, among others many. Three hundred and twenty-two bridges across the Kingdom, in addition to the layout of roads and highways necessary for the articulation of the trade and transport of the interior were built. Set up a regular and official post and Stagecoach service. The capital of the Kingdom was the most benefited in terms of renovations road and architectural; He/She managed a beautification and considerable dignity: the Puerta de Alcalá, the Museum of the Prado, the Academia de San Fernando, etc. From this period dates the order of planting a tree in the main square of peoples as a symbol of respect for law and justice. Any of those trees are still in good condition, as Torralba, in basin olma. The military also had its share of reform. Carlos III introduced the Prussian tactics, the more prestige at that time in Europe thanks to the boost given by the Prussian Emperor Federico II. Opened three military academies, corresponding to the three weapons that divided the army: that of infantry, in el Puerto de Santa María; of the Cavalry, in the town of Ocaña; and finally, the artillery, in Segovia. The Monte Pio military was founded. Because of the impetus given to trade and protection of the American colonies, under Carlos III was to have the second largest naval fleet in the world, with sixty-seven ships of the line, fifty-two frigates, and sixty-two smaller ships. The last great layout of the reign of Carlos III was the creation, in the year 1787, the Supreme Board of State, clear precedent of the current Council of Ministers. Foreign policy during the reign of Carlos III. The most relevant fact of Carlos III's foreign policy was the rupture of the policy of neutrality maintained under the reign of his predecessor Fernando VI, and consequent Spain entering of the seven years war, which had been facing France and England by the domain of the Atlantic and the European continent. This interventionist decision came determined by the reality of the international situation. To Spain, the seven years war not affected him in continental interests, but in its Atlantic seaboard, since as atlantico-americana power of the first order, could stay on the sidelines not adopt a passive attitude to the conflict handed by the dominance of colonial markets. Feared, by Spain, to the great English naval power, but finally opted for the Alliance with France, every time England ruled by William Pitt to constantly despised continued the Spanish Crown against English abuse claims. England, with this belligerent attitude against Spain, sought to RID, not only the own France, but also Spain and stay for just a single unique important American trade power. Dimas relations arrived at a moment of great tension just when there was another momentous event which definitely tipped the Spanish authorities to sign an alliance with France: the overwhelming English victories over the French in the strategic area of the Canada. This English victory directly threatened Spain, since English maritime hegemony became very dangerous. The Marquis of Grimaldi, Spanish Ambassador at Versailles, signed the third Treaty of family, the 15 August 1761, between Spain and France. This new Franco-Spanish Alliance was no longer motivated, like the previous ones, by pure family ties, but by offensive and defensive needs of both countries faced a common enemy: England. English power was so great that the joint military operations, nor the commercial blockade to England gave the desired results. The English seized Havana and Manila. The peace of Paris, signed in the year 1763, temporarily closed the hostilities, and was little beneficial to Spain, but was even more disastrous for France. Spain was able to recover Manila and Havana and received Louisiana from France, as compensation. The position of Spain in America was seriously damaged and had to be hereinafter redoubled efforts against British expansionism, increasingly aggressive and blatant in the Spanish possessions. The privileged position of England in America after the peace of Paris was endangered when, on July 4, 1776, the Congress held in the city of Philadelphia by the British colonies, proclaimed its independence from the metropolis. It was expected, both France and Spain, to strike back to England. The Spanish Crown, at first, doubted whether he/she should intervene directly in the conflict or not, but, aware of the potential negative impact that would mean total independence of its colonies to England, he/she decided to participate in the confrontation. Although he/she did not participate directly, he/she did it by providing money and weapons to the colonies, as well as permission to use its strategic ports to the rebel fleet. Spain also intended with this intervention to recover Gibraltar and Minorca. Depleted England, in the year 1782 was forced, despite its naval might, to recognize the independence of the new State and to sign the peace of Versailles. Spain failed to retrieve Gibraltar, but the island of Minorca and Florida. From this date, Spain tried to remain in a position of diplomatic and political independence away from the interests of France and England. This, Floridablanca has made a policy of clear national content, looking for three fundamental objectives: first, to reaffirm the political role of Spain in the continent; Second, the search for balance in the Mediterranean and in the Atlantic; and last, but not least, enlargement of the exchanges trade, vital to the economic recovery of the Crown. In this context, the Alliance with Portugal, in the year 1779, acquired an asset important to Spain since it solved territorial disputes that had kept the two countries from centuries ago, and entered into a development framework conducive for trade. To reinforce the agreements between both monarchies, was used, as always in these cases, the marriage Alliance between the Spanish Princess Carlota Joaquina the Portuguese Infante don Juan, second son of the King of Portugal. The Spanish Crown returned to see involved in the complicated political system from the Mainland. In its effort to neutralize the hegemony of England and stop the increasingly greater desire for expansion of Russia and Austria, was in need of support diplomatically to Prussia, as the most suitable representative to restore the balance. With the same purpose, Spain went to Turkey. Floridablanca established an alliance with this country in the year 1782, in order to protect the Spanish trade in the East of Asia, to safeguard Spanish possessions in North Africa (Ceuta, Melilla and the Peñón de Vélez) and reinforce the territorial integrity of Turkey, necessary to stop excessive expansionist ambition of Russia and Austria over the Mediterranean. If Spanish relations were excellent with Turkey, it did not happen the same with Morocco, always fluctuating in ambiguities and misunderstandings with the Crown bad Spanish. In the year 1762, signed an agreement with Morocco of eminently commercial, more than political. In the year 1774, there were successive Moroccan attacks on Melilla, and Peñón de Vélez. Due to this situation, prepared an expedition against the city of Algiers, sent by the excellent general Spanish of Irish origin O' Reilly, who failed miserably and that was blamed to the Minister Grimaldi, reason by which ceased in his post and was replaced by Floridablanca. This earned a valuable agreement with Morocco, in the year 1782, and during the war against England, which would give positive results strategic and commercial to Spain because the English had to leave the port of Tangier. This Alliance was followed by others with Turkey, in the year 1782, and with Tripoli, Tunisia and Algiers, all in the year 1786. With Carlos III escalated the care of the American colonies. He/She stressed the task of the Indies, José Gálvez, Secretary of Office which administratively reorganized effective colonies in quartermaster. Such robustness is demonstrated in the failed insurrections of the year 1780, in the Peru, headed by José Gabriel Candorcanqui, who took the Warrior name of Tupac Amaru. This ringleader pretended to be crowned as King of Cuzco. Finally was captured and executed in the same city. In the year 1776, was the third Viceroyalty American, of Buenos Aires, with the intention of protecting this colonial zone of the continuous attacks of the Portuguese and English. The nearly three decades that lasted the reign of Carlos III represented a parenthesis opened in the midst of the ongoing process of decadence that the Spanish monarchy had been suffering. Proof of this was the rapid decline so much prosperity to the death of this great King. Carlos III made penetrate Spain budgets and mentality that prevailed in enlightened Europe, raising the level of the Kingdom to the first power range. Spain was able to show, for the last time, its power, not only in terms of territorial extensions, but also by cultural and European tone that successive ministers availed itself of that printed their initiatives. Carlos III was the perfect representative (comparable to their glorious contemporary Federico II of Prussia and José II of Austria) excellent, reforms of the benevolent and enlightened despot who tried to implement, on several occasions, but alien and difficult to take root in traditional society that ruled. In many ways, Carlos III was a model of many Spanish Liberals who would live in the two subsequent centuries. AGUILAR PIÑAL, F: Bibliography of studies on Carlos III and his time. Madrid, 1988. ARTOLA, M: the Bourbons. Madrid, 1973. BARUDIO, G: the era of absolutism and enlightenment. Madrid, 1983. CALLAHAN, w: Church, power and society in Spain: 1750-1874. Madrid, 1988. RICH LINEAGE, R: Carlos III. Madrid, 1988. Fernandez, R: the Spain of the Bourbons. Madrid, 1996.